Emms was born in Blofield, Norfolk, England, on 21 April, 1841. Little is known of his early life and training; he presumably received instruction from his father, Henry Emms, who was also an artist. He is said to have studied with the noted classicist painter Lord Frederick Leighton, whom he assisted on his fresco The Ten Virgins in the parish church at Lyndhurst, England. Emms began exhibiting at the Royal Academy in London in 1866; he continued to exhibit there fairly regularly until 1906. An avid horseman and frequent rider to hounds, he specialized in animal paintings, particularly those relating to horses, hounds and hunting. His evident skill in depicting his chosen subject earned him numerous commissions. In 1872 he settled in Lyndhurst, and in 1880 he married Fanny Primmer, a woman fifteen years his junior. 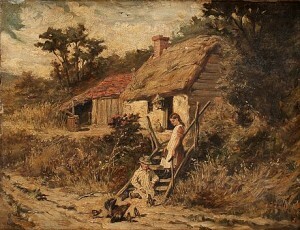 He worked in London during the 1880s, but spent much of the remainder of his life in Lyndhurst; a profligate lifestyle led to erratic finances, and it became necessary for Emms to trade paintings for necessary goods and services when an illness toward the end of his life interfered with his ability to work. Emms exhibited several paintings at the Royal Academy in London; paintings he exhibited there include The Bird's-Nester in 1866, Foxhound Whelps in 1875, Gone Away in 1878, and Digging Out in 1889. He also exhibited at the Society of British Artists, where he showed such works as Beagles, Cub Hunting and Otter Hounds between 1867 and 1885. Emms died in Lyndhurst, England, on 1 November, 1912.